 Spring asparagus can be served at every meal of the day (photo courtesy Good Eggs). Growing asparagus. It’s very labor intensive and back-breaking: The spears need to be cut by hand (photo courtesy Australian Asparagus Council). Simple but elegant: a grilled rack of asparagus (photo courtesy California Asparagus Commission). In the U.S., asparagus is a spring vegetable. When you see it in other seasons, it is imported from abroad. 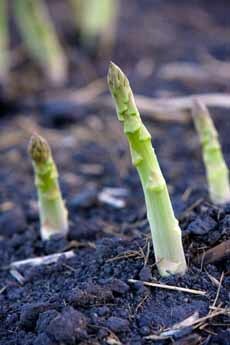 California asparagus is bursting onto the market. Low in calories—just three calories per medium spear—it is full of nutrients and contains no fat or cholesterol. At breakfast in omelets and scrambles, or as a side with poached or fried eggs. At lunch in a quiche, or sliced raw and tossed into salads. As part of a crudités plate. For a dinner first course or side, steamed or roasted and served with a drizzle of olive oil and squeeze of lemon or lime. We have 20 recipes below for breakfast, lunch and dinner. Here’s the history of asparagus. Our friends at Good Eggs, a gourmet grocer in the San Francisco Bay area, point out that different widths of asparagus work best with particular recipes. Thin-Speared Asparagus: About 3/16 inch in diameter—a little thinner than a pencil—thin asparagus are perfect for sautéing. The slim width enables the spears to brown but not burn before they’re cooked through. Medium-Thickness Spears: These are around 3/8 inch in diameter, a little thicker than a crayon. Medium-size asparagus work well for most preparations. Thick-Speared Asparagus: These are extra-large or jumbo, and can be up to just under an inch in diameter—about the same diameter as a quarter. They hold up well to grilling and roasting. 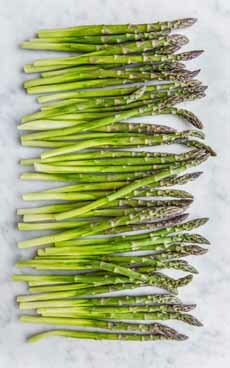 Boiled Asparagus: Bring a pot of salted water to a rolling boil, then gently tip in your prepped asparagus. Boil for 2 minutes or until the asparagus are bright green and al dente. Take them out and lay it in a single layer to cool. Top with chopped hard boiled eggs and herbs for a light lunch, or puree with a little green garlic for a simple pasta sauce. 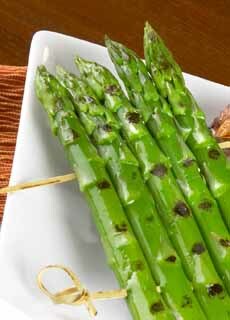 Grilled Asparagus: Asparagus will slip through the grill if you don’t use a vegetable basket or skewers. We actually like the skewer technique, which creates a rack of asparagus. Simply skewer four or five medium or thick asparagus together, brush with olive oil, season to taste, and cook on a hot, preheated grill Preheat grill for high heat for 2-3 minutes per side (depending on thickness), or to desired tenderness. Before you add the oil, however, use the ice bath technique described above. When the asparagus come off the grill, they’ll be moist and crisp. Raw Asparagus: After trimming, use a vegetable peeler to remove the skin below the spear. We like to slice it thinly on an angle to create ovals, to add to salads and grain bowls, but you can also peel it into delicious ribbons. Reserve the tips of the asparagus and mix them in with the rest! Roasted Asparagus: Heat the oven to 400°. Toss prepped asparagus on a parchment-lined baking sheet with a glug of olive oil and a large pinch of salt and roast for 5 minutes or so—until crisped at the tips and slightly browned. But if you do have a bottle of balsamic glaze or balsamic cream, bring it out! Enjoy asparagus every meal of the day! Sponge cake is a light and airy cake with no fat, traditional flour or leavening. The rise comes from beating air into egg whites. Here’s the history of sponge cake. The Jewish-style sponge cake—a Passover mainstay because it has no leavening—is not the same as génoise. Génoise, the French sponge cake made with conventional flour and butter. Passover sponge cake substitutes potato starch and matzoh meal for conventional flour, and contains no fat. Sponge cake is a delight year-round, but is not the only type of sponge cake. Check out the following, and plan ahead for National Sponge Cake Day, August 23rd. PARTY IDEA: Get your friends-who-bake together and have a tasting of all of these for National Sponge Cake Day. 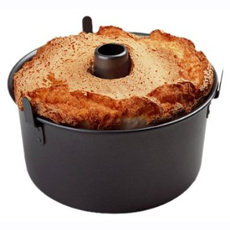 Chiffon cake (photo #1), an American invention, is a hybrid of sponge and génoise. It uses a leavening agent and oil, which makes the cake moist than a sponge. The yolks and oil are beaten with the dry ingredients; the whites are whipped separately and folded in. Here’s the history of chiffon cake. Genoese or Genovese or Italian sponge cake is the original sponge cake, made without leavening but with conventional flour and fat. It was invented in the Italian city of Genoa (one story says it was made in Spain, by the Genoese ambassador to Spain [i.e., his cook]). It is often confused with pan di spagna, but the two are different (see below). Génoise, the French sponge (photo #2), has added fat. Clarified butter enriches the batter and makes the cake moister. The eggs are beaten whole, sometimes with additional yolks. Génoise is used in layer cakes and roulades (rolled cakes), among others. Jewish-style sponge cake or Passover sponge cake (photo #3) was adapted by Italian Jews for Passover (so were Italian amaretti—here’s an [amaretti recipe]), because it contains no leavening. It then spread through other European Jewish communities. It has no added fat, and the yolks and whites are beaten separately. It is typically baked in a tube pan. Ladyfingers or sponge fingers or savoiardi, finger-shaped sponge cookies that originated in late 15th century Italy at the court of the Duchy of Savoy (photo #4). Here’s more about them. They are a form of Italian sponge. Pan di Spagna (“Spanish bread”—photo #5) is another type of Italian sponge cake. While genoese is made by cooking the eggs and sugar together, whisking them over a bain marie and then adding some melted butter, pan di spagna is made without heat. With pan di Spagna, the eggs are whisked separately. The lightness is achieved by whipping the whites into stiff peaks, and there is no added fat. This technique is the same as with Jewish-style sponge cake, except that pan di spagna uses traditional flour. Other sponge cakes include castella (Japanese sponge, very fine crumb), Lamington sponge (from Australia, a jam-filled sponge sandwich dipped in chocolate and covered in coconut), Victoria sponge/Victoria sandwich (U.K.—photo #6) and zuppa inglese (Italian). This recipe is from our mom. Although she is no longer here to bake it, she would be pleased if you did. 1. PREHEAT the oven to 325°F. Separate the egg yolks from the whites, being sure not to get a single drop of yolk mixed into the whites (otherwise the cake will not rise properly). 2. BEAT the yolks; then add the sugar, lemon and orange juices. 4. BEAT the egg whites with a dash of salt in a large bowl, until they are fluffy and stiff (the peaks should separate from the sides of the bowl). Fold in the yolk mixture a bit at a time. Pour into an un-greased tube pan (photo #3) and bake for 50 minutes. 5. TURN the pan upside down to cool. Be sure the top of the cake does not touch the surface, or it will mash in. Mom served this cake as a strawberry shortcake, with whipped cream, berries and the sponge instead of biscuits. This cake is so versatile that you can serve plain, fancy or in-between. Chiffon cake is a hybrid of sponge and génoise. 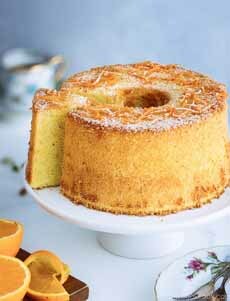 Here’s the recipe for this beautiful Orange Chiffon Cake from Just One Cookbook. 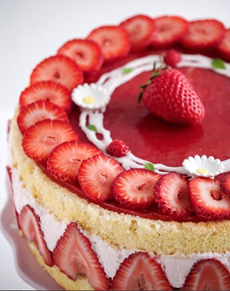 Fraisier, a “strawberry shortcake” made with genoise (photo courtesy G Bakes). 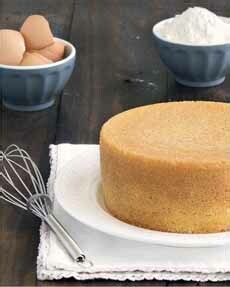 Jewish-style sponge cake (photo courtesy Chicago Metallic Bakeware). 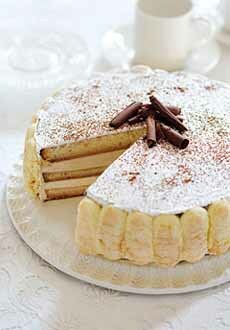 In addition to other uses, ladyfingers are an ingredient in tiramisu (photo of tiramisu cake courtesy Mackenzie Ltd). Pan di spagna. The name is often used synonymously with a genoese sponge, but there is a difference (see bullet point). Here’s the recipe from Easy As Apple Pie. 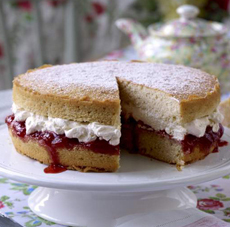 A Victoria sponge or sandwich comprises two sponge layers filled with jam and buttercream, popular at tea time (photo Primo.co.uk). 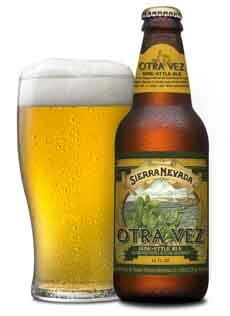 Otra Vez is a gose-style beer from Sierra Nevada (both photos courtesy Sierra Nevada Brewing Co.). April 7th is National Beer Day. If you’re a beer drinker, you likely have your favorite style(s). But what’s trending in beer? Here it is, adapted from Flavor & The Menu for the facts. There are four emerging beer styles in the U.S. (and more new styles are always under development). IPA originated in England centuries ago, an extra-hopped beer created to make the long ocean voyage to the British residents of India. 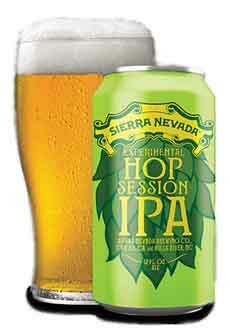 Over the past few years IPA has surged in popularity in the U.S. This sub-variety is fermented with Belgian yeast. The result is a fruity and bitter style, malty and with textural richness. It has what is called “the characteristic funk of Belgian yeast,” with the floral aromatics of the hops. An old German beer style, Gose is an unfiltered beer made with lots of malted wheat. A cloudy brew with moderate alcohol and a refreshing crispness, it’s less bitter than many other styles: dry and tangy from the addition of coriander seeds and salt. Like fruit beer? As with Berliner Weisse beers, a Gose can be served with fruit or herb syrups. “Sessionable” beers are those with moderate levels of alcohol. These are made to be easier to quaff (i.e., less alcohol means you can drink more without “effect”). The increased popularity of hoppy pale ales has led to the creation low-potency session ales that are 3% to 4% ABV, and have more aroma and flavor from hops. Some are brewed to be less bitter, as well. Sour beers are an ancient style, with a flavor profile ranging from a gentle tang to a powerful dry astringency—more like Champagne than beer. 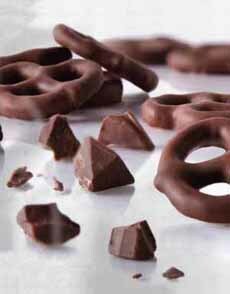 They also can offer challenging flavors and aromas unfamiliar to most beer drinkers. They sound amusing, but are real: barnyard, blue cheese and horse blanket, among other characteristics. The brews use added or naturally occurring yeasts. Ready for some horse blanket? BEER TRIVIA: Beer is the third most consumed beverage in the world, after water and tea. Flavor & The Menu, a magazine and website for chefs that reports on food trends, has recommended a new one: breakfast pizza. You may have encountered breakfast pizza, but it’s far from ubiquitous. “The explosive growth of fast casual [dining] has helped elevate pizza to new heights and has kept this exciting category on fire,” says the magazine. What does the publication find in the breakfast pizza category? Look not just to breakfast, but to brunch favorites. Here are some ideas, but what do you like for breakfast? Make your own breakfast-centric pizza creations. Everything Bagel & Lox Pizza: Whipped chive mascarpone/cream cheese, blistered red onions, fried capers and everything-bagel spice mix, topped with smoked salmon. Pancetta Pizza #1: Pancetta, shredded Yukon gold potatoes, red onion, fontina cheese and a runny egg (at the Red Rabbit in Minneapolis). Pancetta Pizza #2: Shaved pancetta, ricotta, baby kale, caramelized onion and pesto hollandaise (at Pacific Standard Time in Chicago). Shakshuka Pizza: Hatch chile/harissa tomato sauce, fresh spinach, bell peppers and feta crumbles, topped with a runny egg. Arugula or asparagus, with goat cheese and eggs. Balsamic-marinated cherry tomatoes, with with onion and eggs. Breakfast meat mash-up: Bacon, ham, sausage and optional corned beef hash, with eggs. Chopped broccoli or kale atop ricotta, with bacon or red bell pepper or sundried tomatoes. Corned beef hash and ricotta with fresh herbs and sunnyside-up eggs. 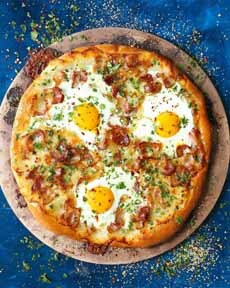 Bacon and egg pizza. Here’s the recipe from Damn Delicious. If you don’t want bacon, how about sliced, roasted fingerling potatoes and chives? Or salmon caviar? 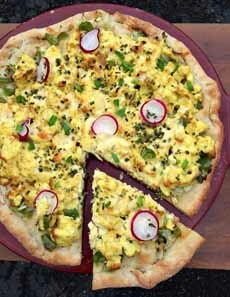 Scrambled egg pizza with cheddar and chives. Here’s the recipe from Clean Eats Fast Feets. Grilled or sautéed mushrooms with mozzarella, ricotta and sundried tomatoes. Fruit pizza with ricotta, fruit purée “sauce,” berries and bananas. Serve with yogurt or peanut butter drizzle. Ham and eggs of choice (American ham, pancetta, prosciutto, etc.) atop mozzarella with fresh herbs and cherry tomato garnish. Mashed avocado atop ricotta, topped with a sunnyside-up fried egg. Sausage, caramelized onions, fresh basil and eggs. 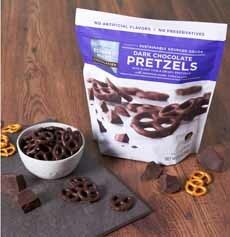 The Dark Chocolate Pretzels are available at select Costco locations, as well as online at EdwardMarcChocolatier.com.